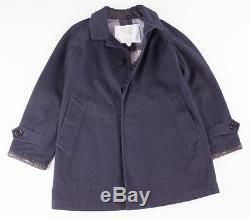 BOYS NOVA CHECK NAVY BLUE LEATHER PEACOAT JACKET. THIS IS A NICE COAT. DESCRIPTION: IT HAS TWO FRONT BUTTON CLOSURE POCKETS. THE TOP BUTTON BY THE COLLAR IS VISIBLE. IT IS FOUR HIDDEN BUTTON CLOSURE COAT. ON THE SLEEVE IT HAS BUTTON STRAP. MEASUREMENTS: SHOULDER TO SHOULDER: 14 1/2" ARMPIT TO ARMPIT: 15" TOP TO BOTTOM: 22 1/2" SLEEVE LENGTH: 15 1/2" MATERIAL: 100% COTTON MADE IN THAILAND PLEASE SEE IMAGES FOR SPECS. COMES FROM A PET AND SMOKE FREE ENVIRONMENT! PLEASE BE ADVISED THAT ITEM COLOR AND SPECIFICS MAY DIFFER IN CHANGE OF LIGHTING. Show off your items with Auctiva's Listing Templates. The item "BURBERRY CHILDREN BOYS NOVA CHECK NAVY BLUE LEATHER PEACOAT JACKET 5/6 NWT $495" is in sale since Wednesday, December 07, 2016. This item is in the category "Clothing, Shoes & Accessories\Kids' Clothing, Shoes & Accs\Boys' Clothing (Sizes 4 & Up)\Outerwear". The seller is "luisxv2011" and is located in California. This item can be shipped worldwide.